Well, our winter ski season in Morzine, France is finally over. The final few weeks were great, with some fantastic spring weather, but the snow really did start to suffer towards the end. On our penultimate week we had a 'girls only' snowboard camp that was run in conjunction with the girls at 'Our Camp', which was a huge success. It obviously was tough for me that week to have the chalet completely full with 16 girls! My wife Deborah was lucky enough to be allowed to tag along and get some instruction with the guests, and everybody really started to get into the mood hitting the kickers in the terrain park and encouraging each other to go bigger and better. Jon, our boss, and myself however were forced to sit on the sidelines and just take photos, although I did get to sneak in a little personal instruction from Emma, and I managed to land my first few backside 360s, which I was really pleased with! During the last few weeks the snow really did start to get a bit too slushy though, and accidents were a problem. Both Lisa, our other boss, and a guest ended up badly damaging their knees whilst landing jumps, which was at least partly made worse by the extremely wet snow conditions. There also really was no snowfall during those final weeks and you could have mistaken it for summer around Morzine itself. The flowers were out and it was nice going for a stroll along the river. My biggest regret was not bringing out my mountain bike for the winter, as gradually we would see more and more people out there riding their bikes were we had been snowboarding only weeks before. So, finally, after 20 weeks, 260 guests and after serving over 120 four course evening meals in our chalet, it was time to leave. We were sad to go, as we had made some good friends in Morzine. However we were also glad to be leaving and moving on. It certainly had been a difficult season with the poor snow conditions making things very tough for us and guests alike. We also had to struggle with a self-confessed 'nightmare boss' who used to work as a police officer, and we had to deal with not being given as much freedom and responsibility as we had received in previous winter seasons, when we had been trusted to just get the job done. But we certainly learned many things about how to run a successful business, particularly with the marketing side, and we certainly did enjoy our season working for Ride & Slide. 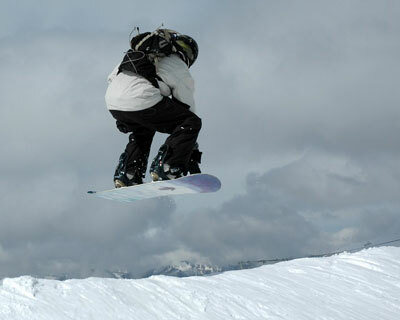 But will we be back in Morzine next winter? Well, the answer, unfortunately, is no. 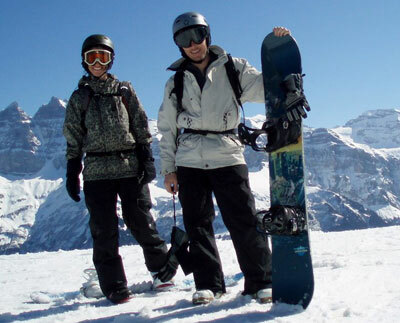 Morzine is a great town and it certainly is a great place to set up a small chalet firm. In fact, it is so good that already there are over 80 small 'luxury' chalet firms in Morzine, operating about 160 chalets between them! It was bizarre when you would often find yourself in a convoy of 12 almost identical minibuses heading down the mountain towards Geneva airport each weekend on transfer day. an airborne Ian: looks like those lesson paid off! It also appeared that every company was trying to outdo each other in some way, whether it was by being the most luxurious, the most snowboard-friendly and cool or the one with the best hi-tech gadgets. In Morzine there are already numerous different companies specializing in different 'ski' markets - there are the 'family-friendly' companies with nannies, chalets just for Irish guests, companies that will provide you with your own ipod and 'personalised playlist' every day, and even a chalet company that specialises in Swingers weeks! Now that would be worth checking out! It surely is only a matter of time before a company opens that specialises solely in 'luxury' holidays for the pet-loving Welsh one-legged colour blind snowboarder! There is still space for more companies there, and with the absence of most of the big ski companies there is the opportunity for the smaller companies to flourish in Morzine, but it is not for us. We have no desire to do the same as everyone else has already done, and battle it out with the compeition for paying guests. It's all too easy to copy another company's website and marketing and set up a chalet business, but that wasn't really what we wanted to do. The snow was also an issue this year. 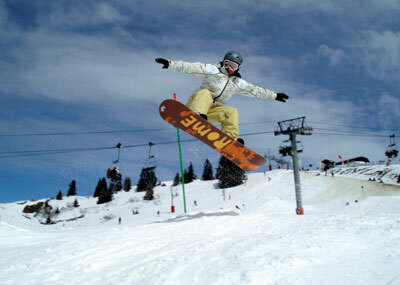 Morzine is very low for a popular ski resort, sitting at only 1000m. It only snowed around our chalet four times this winter season. But obviously this was a common theme across Europe, and almost all ski resorts in France, Switzerland, Slovakia etc had one of their worst seasons in many years. It is also fairly likely that this was just a natural 'blip' in the general weather pattern and the doom-merchants are probably being a little too quick to cry 'global warming'. However it is certainly an eye-opener when you see businesses struggling to get financial backing from the local banks because the bank managers are worried about investing in a business which they fear may not be profitable in 15 years time due to global warming creating poor snow conditions. So, Deborah and I have decided we do not want to tie ourselves down to just one town, one market or one season. Instead we have decided that perhaps it is a good time to head back to Australia, and do something a bit different. We also didn't really want to spend the next five years cleaning toilets and cooking meals. So instead, we have decided it is time to set up a proper 'Adventure Travel' company for the Australasian market. Obviously I can't divulge our plans entirely, but I am hoping a heli-boarding & mountain biking trip to Chile is only a few years off! We will keep you informed! Ian Fehler spent the winter season living and working in Morzine France, for Ride and Slide Chalets.